finally, a web site that works for you! Ok, I ordered a web site. What's next? Once you've ordered your web site, you will need to set your nameservers to one of our web servers so that we can take care of your setup for you. To do so, log into your Registrar account and look for an option to Manage My Domain or Manage Nameservers or Manage DNS (the exact wording of this function varies from registrar to registrar). Select ONE set of DNS settings below, and replace the current default settings with these. If you are on the BLUE package, it doesn't really matter which set of nameservers you select, just be sure that you use ONLY 2 nameserver values and that you delete all previous DNS entries. 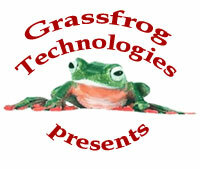 If you are on any other hosting package, please use the grassfrog.net servers for your settings. If you require assistance with your nameservers, click here to email us. My web site's contact form (order form) isn't working. Is it broken? First of all, check to ensure that you have set your email address properly in the TO and FROM fields in the contact form's module (or order form's module). To do so, click on MODS then SETTINGS next to the FormBuilder (or FormRequired or OrderForm) module. Place your full email address in both the TO and FROM fields. Make sure you also have a Subject set on this page. Click SAVE SETTINGS. If your CMS has a MyInfo tab, then this is already taken care of for you. Second, if your email address is properly set but you are not receiving your contact forms, check your email SPAM folder and/or SPAM filtering options. This can be done at the user level, or by your ISP (with or without your knowledge). Some ISPs block mail based on the IP address of origin - if you are not receiving your contact form emails you need to either contact them to ensure your mails are not being filtered, blocked or blacklisted in any way, or you can provide an alternate email address for your contact form (see below). We recommend to our customers the free email service by Google called Gmail. Gmail allows you to post an alternative email address on your web site and contact form that you can set to forward to your primary email account. Gmail will automatically filter the emails it receives, forwarding just the "good" ones to your home email account and leaving the "spam" ones in a folder on your webmail account. Gmail also allows you to keep a backup online of all emails received through your website, and because it is by Google, may also help your web site's relevance on the web. When will my web site be ready? Once you've put in your DNS change request through your registrar, it takes the registrar 12-72 hours to make the DNS change. Once the DNS change propagates, we can set you your web site. It takes us approximately 24-48 hours to complete your web site setup once we have the DNS. Someone told me my links portal page URL is too long and won't be indexed by the search engines. They won't link with me for this reason. What can I do about this? Search engine spiders interpret dynamic links in various ways. Google does index dynamic links, as do several of the other major engines, however there is a theory out there that dynamic page links with more than one operand variable are not "as good" as static pages. The LinksPortal does function in that way, however you can always build static links on a separate page on your web site so that you have a more direct URL to give them. Your other site pages all contact a single variable and are fully indexable. How can I get a business email address ([email protected]) through Grassfrog? Domain-specific email (forwarding) accounts are now FREE with every website. If you want to be able to send and receive email on your own domain, then you need to get an email account through GoDaddy (free with your domain registration or transfer) then send us the information we need to set up your account on our servers by specifying the CNAME and MX records. We charge a setup fee for this type of email account, to cover our time to set it up for you. All email accountholders are subject to abide by our terms of service agreement regarding unsolicited bulk email (UBE) and spam. copyright © 2006 Grassfrog Technologies LLC. All rights reserved.